Lucy Knisley's life revolves around food. The smells and tastes permeate her memories. Relish: My Life in the Kitchen is Knisley's memoir of her life growing up in the kitchens and dining rooms of diverse restaurants and eateries around the world. 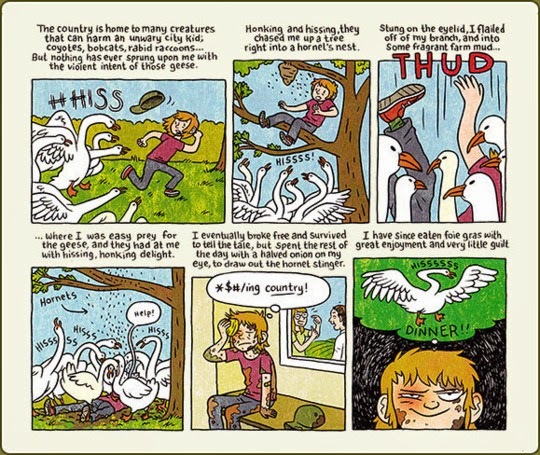 A cartoonist, the author shares her story in graphic novel format. She tells of her family's love of food, her travels, her love of art and her involvement in the food industry herself. As a young girl, Knisley moves from Manhattan to farm country with her mother upon her parents' divorce. Her mother is a chef and her father a gourmet; neither can stand the fact that their daughter loves McDonald's french fries. Mostly, though, she grows up with an appreciation for fresh ingredients and local flavors, whether the locale is her home town, Mexico, Japan or some other country to which she travels in her youth. I enjoyed reading about Knisley's life and the role food played in her experiences. She writes her story in a fun, positive and energetic manner that is accented with full-color cartoon strips that show her life visually. At the end of each chapter, she shares beautiful, visual recipes of some of her favorite dishes. My favorite was the chapter in which she recounts her failure at recreating the most perfect croissants that she had tasted in Europe. At the end of the chapter, rather than give a croissant recipe, she shares one for sangria! 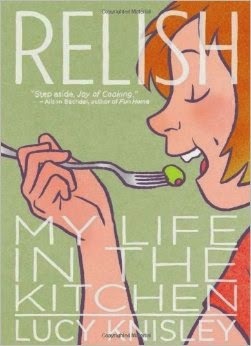 If you have any sort of passion for food, I highly recommend Relish: My Life in the Kitchen . This is such a fun memoir, both in the stories told and in the manner in which they are told. Knisley has a way with words and illustrations, and a way with transferring her love of food to her readers. This review was written based on a copy of Relish that I borrowed from the library. Yay for Relish! I just wrote about this one too. I think my favorite part was that she made food so accessible and didn't make you feel guilty for your McDonald's french fries (or whatever your equivalent is). I completely agree! I'll have to check out your review as well. I just happened to pick this one up at the library. It was a "blind date" book that was wrapped up so I didn't even know what I was getting at the time!